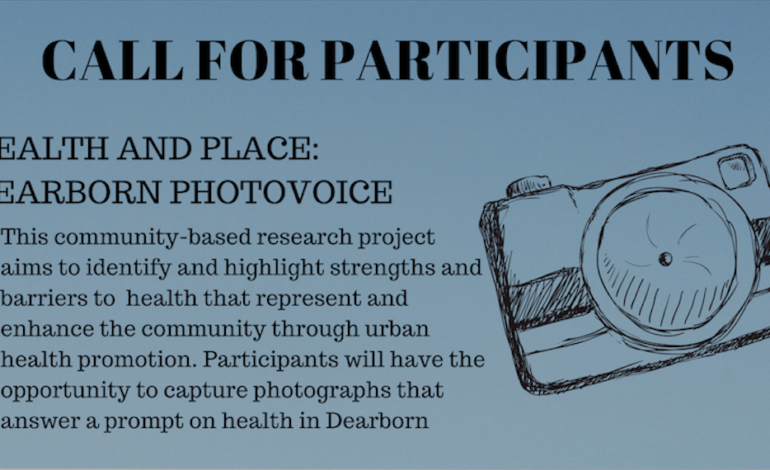 DEARBORN — A University of Michigan graduate student is asking for participants for a “photovoice” research project to observe what Dearborn residents feel affects their health in the city. Fatima Hassan, who is working on her master’s degree in public health, said she’s excited to recruit Arab Americans for the study she’s been designing. A study published in 2018 by Frontiers in Public Health found that although Arab Americans are a historically understudied minority, there has been an increase in studies on the community since 2009. Hassan said the study will consist of two sessions. The first session will instruct participants on the study process and give tips on photo-capturing. During the second session, held a few weeks after the first, she and the participants will go through the findings and attach captions to go along with the photos. “Photovoice is a qualitative research method that places the autonomy and the camera in the hands of the community,” Hassan said. She said findings from the study will be turned into a miniature exhibit at the Arab American National Museum. Hassan is a Michigan native and grew up around the Dearborn area. She said she’s interested in “the way that everything impacts health.” She graduated from Wayne State University with a bachelor’s degree in government affairs. She asked that participants call to take part in the study by May 8. Anyone over the age of 18 with questions or who is interested in participating can email Fatima Hassan at hassanf@umich.edu.